There have been enough well publicized cases of long term gold dealers being sold fake bars recently to cause the average investor some real concern. Just recently the Canadian Broadcast Corporation (CBC) reported that a well established gold dealer in Ottawa purchased a gold bar from a local branch of the Royal Bank Of Canada only to later discover the bar was counterfeit. The Royal Bank Of Canada did refund the purchase price mentioning that they did not mint the fake bar and is said to be investigating the matter. However several experienced gold experts say the problem is far larger of an issue than this RBC event indicates. According to Martin Westcroft, a metals expert, the best way to protect yourself is to buy products from the US or Royal Canadian Mint and to never buy bars. Martin says, “The Royal Canadian Mint has built some very advanced anti counterfeit technology into their coins that is way more sophisticated than the counterfeiters in this day and age”. He adds, “For this reason I never recommend bars at least until the bar refiners catch up with the latest technological advancements”. Mr Westcroft adds, “This is why you have seen bars discounted well under spot price upon client liquidation in the last several years”. Martin continues, “It’s a growing trend. It’s because buyers must deploy so much more time and effort to determine the authenticity of bars”. He adds, “Don’t take my word for it, call 3 or 4 dealers yourself and say you have some well known bars to sell and watch how they’ll discount the buyback, offering $20- $30 dollars under the current spot price”. You pay slightly more for a reputable mints coins but it’s the best way to invest because you can be sure your purchased products have the backing of a reputable producer and offer that governments guarantee of purity. The coins also tend to buy back at above spot price which saves you in the long run and hopefully gold spot has risen as well. 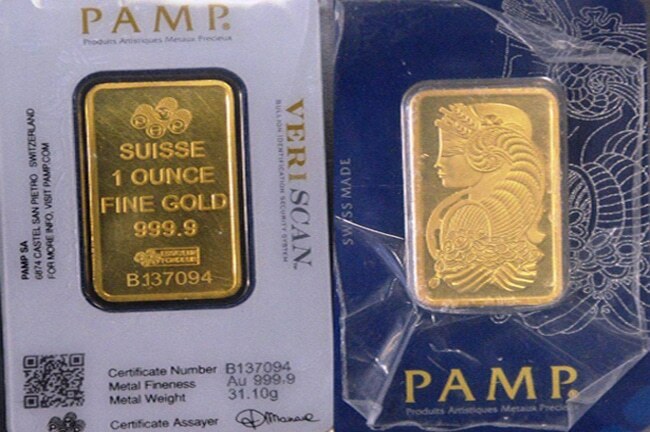 Other well known bar brands that have been attacked buy counterfeiters in recent years are Pamp Suisse and Credit Suisse.